Publication details: Book. 2007. xviii and 128 pages. Publication date: 2007-07-12. with 57 figures, of which 7 in full color, and 7 tables. Hardbound. 16x24 cm (6.3x9.4 in). This is the fourth glaucoma consensus held under the auspices of the AIGS, now renamed as the World Glaucoma Association (WGA). We anticipate that the discussion and conclusions from this consensus will have broad impact, as the relationship between IOP and the disease is fundamental to the care of glaucoma patients worldwide. As with the previous consensus meetings on Glaucoma Diagnosis, Open-Angle Glaucoma Surgery and Angle-Closure Glaucoma, this consensus report was developed over several months in an interactive internet system. The Consensus faculty, consisting of leading authorities on various aspects of IOP from throughout the world, has met in Fort Lauderdale on May 5, 2007 to discuss the reports and refine the consensus points. In the 1980s, health policy researchers from outside ophthalmology challenged the most closely-held beliefs in our field. They pointed out that an objective review of the extant literature provided little evidence that IOP bore a strong risk relationship to glaucoma, and furthermore that there was even less evidence that lowering IOP was of any benefit in the treatment of the disease. Ophthalmology responded with over two decades of groundbreaking clinical and basic research. Multi-center clinical trials like the AGIS, OHTS, EMGT and CNTGS leave no doubt that IOP is a primary risk factor for the disease and that lowering IOP is beneficial in a majority of our patients. Basic research, in particular animal models of elevated IOP and glaucomatous damage, form another intellectual cornerstone establishing the relationship of IOP to the disease. And yet...over the last decade we have begun to acknowledge that the relationship of IOP to the disease is not as clear-cut as we like to believe. Indeed, our ability to even measure IOP accurately has come into question, with the recognition that central corneal thickness significantly affects tonometry. What should we be measuring? Random IOP? IOP fluctuation? Nocturnal IOP? How should IOP be studied in clinical trials? How should clinicians use IOP in the care of individual patients? Obtaining consensus on how IOP should be measured and used in the care of patients and in performing clinical research is a daunting task. As with the previous AIGS consensuses, the IOP consensus is based on the published literature and expert experience. Although consensus does not replace and is not a surrogate for scientific investigation, it does provide considerable value, in particular when the desired evidence is lacking. The goal of this consensus was to establish what we 'know' and what we 'need to know' to better understand the role of IOP in glaucoma. We hope that this consensus will serve as a benchmark of our understanding in 2007, and that it will be revised and improved with the emergence of new evidence. Intraocular Pressure is the subject for the fourth Consensus report published under the auspices of the AIGS, now renamed as the World Glaucoma Association (WGA). It seems like yesterday (November, 2003) that the inaugural AIGS Consensus meeting was held in San Diego to discuss Glaucoma Diagnosis. Since then we have had annual consensus reports on Open Angle Glaucoma Surgery and Angle Closure and Angle Closure Glaucoma. Each of them has been preceded by several months of active participation in our Project Forum E-Room (beginning in January, 2007 for the IOP Consensus) by expert members of the various consensus committees. As done with prior reports, the preliminary document was circulated to each of the member societies of the WGA, and additional comments were solicited for the document. Each member Society also was invited to send a representative to attend the consensus meeting that was held in Fort Lauderdale, Florida on May 5, 2007. The report then was discussed extensively during the Consensus Meeting and Consensus Statements were revised following these discussions. 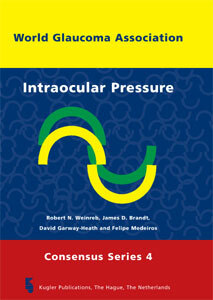 Intraocular Pressure is a topic that touches the essence of our subspecialty. Its measurement is a vital aspect of glaucoma diagnosis and treatment. For now, it is the only modifiable risk factor. Measurement of IOP is a relatively recent - one century - addition to our diagnostic armamentarium. Even though the measurement of IOP is relatively simple, it is by no means uncomplicated. The greatest limitation is probably the paucity of measurements that are obtained in practice. Although continuous IOP measurement is on the horizon, it still is not ready for clinical practice. Arriving at a consensus often can be circuitous and filled with compromises. However, this opportunity is used to critically assess the evidence and develop consensus points. The reader will find this consensus report instructive, practical, and thought-provoking. Moreover, it has great potential to impact patients, both individually and collectively, through both their care and research. Felipe A. Medeiros, James Brandt, John Liu, Mitra Schi, Robert N. Weinreb and Remo Susanna Jr.